Just a quick post today to let you guys know Lorac is on sale today on Hautelook. Click here if you need an invite. I am clueless when it comes to make up. I don’t have a case full of makeup products like some other ladies do. I have been following some of makeup gurus and learned so much about makeup products. 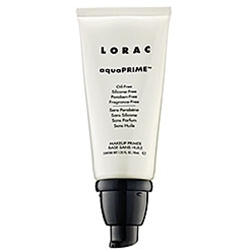 I recently purchased LORAC aquaPRIME Oil Free Makeup Primer from Hautelook at a decent price. It is still full-priced at Sephora. **Update** This product is on sale on Hautelook right now for $8.00 (from $30.00). I have been using this product for the past 2 weeks and I love it. I will do a full post on some of the makeup products I have recently purchased. Sale starts at 11:00 AM EST so be sure to check it out. I have purchased from Hautelook multiple times and everything went relatively well. oooh, good to know! i always see this brand at Sephora but haven't ever tried out any of their products. i'll definitely have to check out what Hautelook has on sale for them today. can't wait to see the rest of your makeup review post! Ah, LORAC is always expensive so a good thing you grabbed this on sale! I've always wanted to try out their eyeshadows, I hear they are really bright and pigmented. Aww, I haven't signed up yet for the PFC because I haven't been able to settle on an outfit! This will be the first one that I might have to sit out. I can't wait to see everyone else's post! I highly recommend the Perfectly Lit Oil-Free Luminizing Powder by LORAC. It was on a special sale at Sephora months ago. From $32 to $8! I have it in Spotlight. It brightens my face, without being too obvious. I hope I do my PFC correct this time! Last time Kelly could not find my link. I sent you the link that my post will be named...so that should do the trick! Can't wait to see all the entries! I'm a makeup n00b as well, so I'm looking forward to your review on this primer. Have you tried other primers before? If so, would you mind doing a comparison to this one? I don't remember if I signed up for PFC #3 (d'oh!) I'm pretty sure I did, but count me in if I forgot! oh, cool! I haven't tried any Lorac products yet. I would get this except I have way too many primers I need to use up first. I have been on a hunt for a primer for a while now, can't wait to see your review. I bought a few Lorac eyeshadows for my sister-in-law a year ago but never asked how she liked them. I feel bad that I have to opt out from this challenge, mainly because I don't have a style icon. Can't wait to see what you and other ladies come up with.